This post is to give actual experience on dedicated track tyres. 1) Toyo 888's....brilliant tyre but pricey. When they let go its progressive and easily controlled. 2) Kuhmo V70's....Imo these are better than the 888's but are still expensive. 3) Federal 595RSR...excellent track tyre but sidewalls aren't as stiff as the tyres above so have a tendency to fold when attacking fast corners. On the road this isn't a problem though and they just keep on gripping. When they let go its progressive and easily controlled. 4) Yokohama 048's...terrible tyres on a 9000, hated them, spent more time showboating with drifts and tyre smoke than making fast progress. 5) Kuhmo Ecsta C03's....best tyres I've ever used, but not road legal, these are rally tyres and offer grip way above any of the tyres above....but they don't last long . 6) Nankang NS2R...just bought some to try out. Cheapest track tyre on the market but have got good reviews. I've gone for the harder option, 180 wear rate against the 120's. To be updated after Blyton Park (not Croft, my mistake) next month. Last edited by mrd2525 on Fri Sep 18, 2015 8:05 pm, edited 1 time in total. Liking this thread, looked at the NS2R but wasn't convinced about the load rating being enough. Where did you get yours and what's their ratings? Dunlop DZ03 are a fair bit better than the V70a which were already excellent. The DZ03 seem to hang on very well and are very progressive too. Will be buying another set once these ones die off. Thought you had Michelin pilot sport cups on yours Phil? Only for a brief period - I had 'new ones' but the manuf date was 9 years old and once on the track they were rubbish. Never again will I buy track tyres older than a year or so - they seem to go off much faster than road tyres. Good thread - keep wondering what to get for FB3...did Cadwell on some very average Mich road tyres (PS3), Mark411's 9000 was so much quicker on the twisty stuff with the tyres he was using - R888s or R1Rs I think. When are you coming up to Croft, Mark? Surprisingly they are okay on damp and wet roads but Im always wary of standing water. 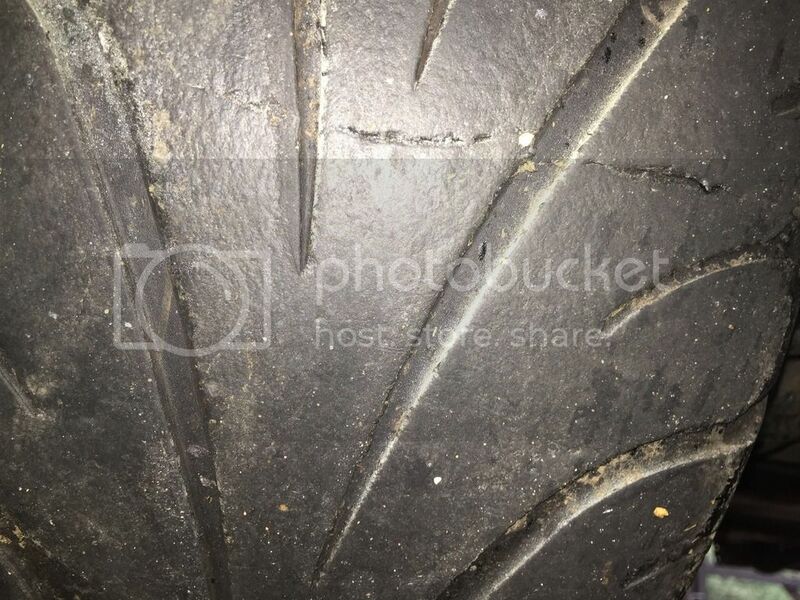 I've 2 tyres on my car at the moment with the overlap line showing. It only happens on the track and I've had it on other track tyres too. Only a problem if the tyre is put on the wrong direction imo. Not too sure about road noise as my car is not that quiet but wear rate on the road I would reckon to be very good. Thanks for the reply, yes the cracking doesnt appear to be too bad. Do they work well from cold or need a while until they start to grip/hook up? My current ultrac sessantas are quite good once they see some heat into them (which is relatively easy as they will burst out in clouds from the slightest enthusiastic launch when cold) but i dont like the fact that for any shorter journeys the grip isnt good. Also you mention direction, arent they assymetric or they are side handed? They grip immediately and side handed indicated by directional arrow...if that's what you meant? Good thread - keep wondering what to get for FB3...did Cadwell on some very average Mich road tyres (PS3), Mark411's 9000 was so much quicker on the twisty stuff with the tyres he was using - R888s or R1Rs I think.. I am using the Federal RSR's up front with relatively slippery Toyo T1R's at the back. I have found a nice balance where I can maintain front end grip and make best use of the lsd while the rear is a little light but still controllable and progressively steps out when hooligan mode is engaged. I've also just got Dunlop Direzza's Mark.. 225x45x17 Dunlop DZ03 H1 Hard compound which seem to last longer with road use and hopefully on track.. Same as Phil and he seems to like his a lot.. sure Stu has used them also..
Ah righto...if it had been Croft I have tried to get up there. I'm only half an hour away. I had some Michelin Pilot Sports Cup 225/45 17 which I used on my race 9000. Excellent tyres but my formula have now stopped these being used so I have some to sell. They still have stickers on. I currently have 8 for sale. £80 each. £500 for all 8. What load index are they? And what year were they manufactured?